Have you ever wondered how those three little numbers that appear in the UNIX® load average (LA) report are calculated? This TeamQuest paper explains how and how the load average (LA) can be reorganized to do better capacity planning. But first, try testing your knowledge with the “LA Triplets” Quiz. In this two part-series I want to explore the use of averages in performance analysis and capacity planning. There are many manifestations of averages e.g., arithmetic average (the usual one), moving average (often used in financial planning), geometric average (used in the SPEC CPU benchmarks), harmonic average (not used enough), to name a few. More importantly, we will be looking at averages over time or time-dependent averages. A particular example of such a time-dependent average is the load average metric that appears in certain UNIX commands. In Part 1 I shall look at what the load average is and how it gets calculated. In Part 2 I’ll compare it with other averaging techniques as they apply in capacity planning and performance analysis. This article does not assume you are a familiar with UNIX commands, so I will begin by reviewing those commands which display the load average metric. By Section 4, however, I’ll be submerging into the UNIX kernel code that does all the work. Actually, load average is not a UNIX command in the conventional sense. Rather it’s an embedded metric that appears in the output of other UNIX commands like uptime and procinfo. These commands are commonly used by UNIX sysadmin’s to observe system resource consumption. Let’s look at some of them in more detail. The generic ASCII textual format appears in a variety of UNIX shell commands. Here are some common examples. It shows the time since the system was last booted, the number of active user processes and something called the load average. The load average appears in the lower left corner of this output. Notice that the first line of the output is identical to the output of the uptime command. In each of these commands, note that there are three numbers reported as part of the load average output. Quite commonly, these numbers show a descending order from left to right. Occasionally, however, an ascending order appears e.g., like that shown in the top output above. The load average can also be displayed as a time series like that shown here in some output from a tool called ORCA. Although such visual aids help us to see that the green curve is more spikey and has more variability than the red curve, and it allows us to see a complete day’s worth of data, it’s not clear how useful this is for capacity planning or performance analysis. We need to understand more about how the load average metric is defined and calculated. 2. So what is it? So, exactly what is this thing called load average that is reported by all these various commands? Let’s look at the official UNIX documentation. Oops! There is no man page! The load average metric is an output embedded in other commands so it doesn’t get its own man entry. Alright, let’s look at the man page for uptime, for example, and see if we can learn more that way. system load averages for the past 1, 5, and 15 minutes. So, that explains the three metrics. They are the “... load averages for the past 1, 5, and 15 minutes.” Which are the GREEN, BLUE and RED curves, respectively, in Figure 1 above. Unfortunately, that still begs the question “What is the load? Let’s turn to some UNIX hot-shots for more enlightenment. The load average tries to measure the number of active processes at any time. As a measure of CPU utilization, the load average is simplistic, poorly defined, but far from useless. What’s high? ... Ideally, you’d like a load average under, say, 3, ... Ultimately, ‘high’ means high enough so that you don’t need uptime to tell you that the system is overloaded. Hmmm ... where did that number “3” come from? And which of the three averages (1, 5, 15 minutes) are they referring to? The load average is the sum of the run queue length and the number of jobs currently running on the CPUs. 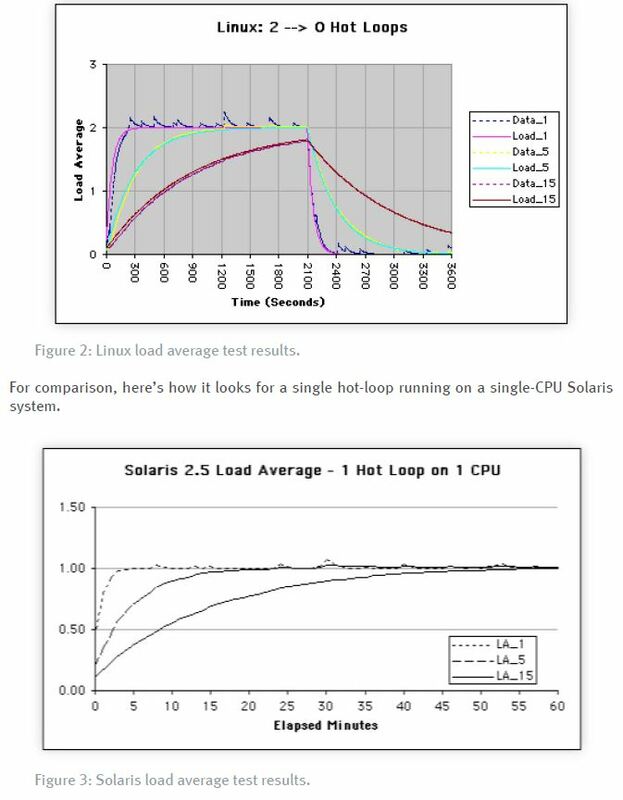 In Solaris 2.0 and 2.2 the load average did not include the running jobs but this bug was fixed in Solaris 2.3. So, even the “big boys” at Sun can get it wrong. Nonetheless, the idea that the load average is associated with the CPU run queue is an important point. ...different systems will behave differently under the same load average. ... running a single cpu-bound background job .... can bring response to a crawl even though the load avg remains quite low. As I will demonstrate, this depends on when you look. If the CPU-bound process runs long enough, it will drive the load average up because its always either running or runable. The obscurities stem from the fact that the load average is not your average kind of average. As we alluded to in the above introduction, it’s a time-dependentaverage. Not only that, but it’s a damped time-dependent average. To find out more, let’s do some controlled experiments. CPU was pegged for 2100 seconds and then the processes were killed. CPU was quiescent for the remaining 1500 seconds. A Perl script sampled the load average every 5 minutes using the uptime command. Here are the details. The CPU is pegged by these tasks for 2,100 seconds. The CPU is (relatively) quiescent for the remaining 1,500 seconds. The 1-minute average reaches a value of 2 around 300 seconds into the test. The 5-minute average reaches 2 around 1,200 seconds into the test and the 15-minute average would reach 2 at around 3,600 seconds but the processes are killed after 35 minutes (i.e., 2,100 seconds). The Linux kernel also checks to see if there are any tasks in a short-term sleep state called TASK_UNINTERRUPTIBLE. If there are, they are also included in the load average sample. There were none in our test load. The following source fragment reveals more details about how this is done. So, uptime is sampled every 5 seconds which is the linux kernel’s intrinsic timebase for updating the load average calculations. The results of these experiments are plotted in Fig. 2. NOTE: These colors do not correspond to those used in the ORCA plots like Figure 1. Although the workload starts up instantaneously and is abruptly stopped later at 2100 seconds, the load average values have to catch up with the instantaneous state. The 1-minute samples track the most quickly while the 15-minute samples lag the furthest. You would be forgiven for jumping to the conclusion that the “load” is the same thing as the CPU utilization. As the Linux results show, when two hot processes are running, the maximum load is two (not one) on a single CPU. So, load is not equivalent to CPU utilization. From another perspective, Fig. 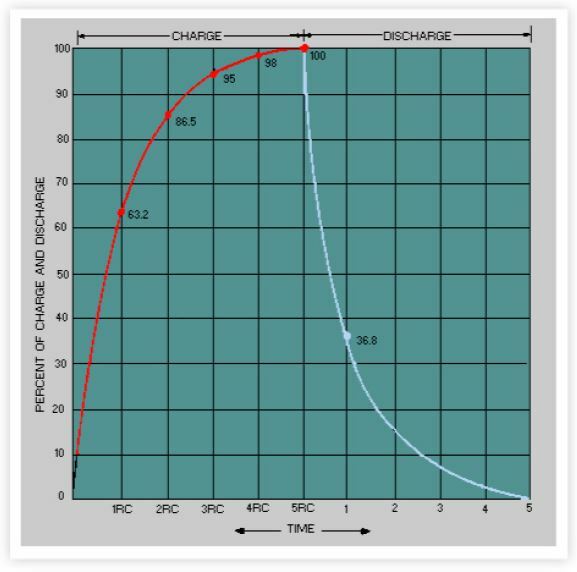 2 resembles the charging and discharging of a capacitive RC circuit. Now let’s go inside the Linux kernel and see what it is doing to generate these load average numbers. The countdown is over a LOAD_FREQ of 5 HZ. How often is that? So, 5 HZ means that CALC_LOAD is called every 5 seconds. 56 * 11 bit fractions. These magic numbers are a result of using a fixed-point (rather than a floating-point) representation. These numbers are in complete agreement with those mentioned in the kernel comments above. The fixed-point representation is used presumably for efficiency reasons since these calculations are performed in kernel space rather than user space. One question still remains, however. 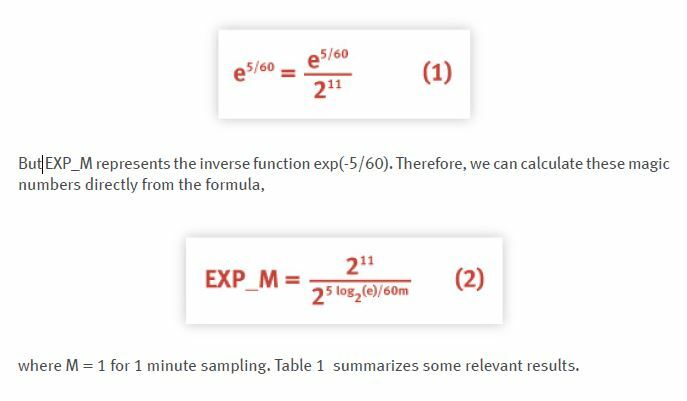 Where do the ratios like exp(5/60) come from? which is pure exponential decay, just as we see in Fig. 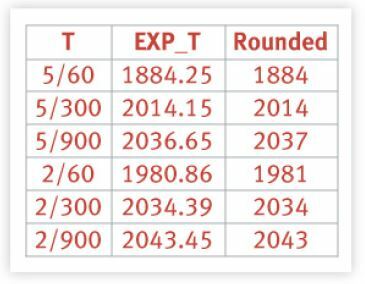 2 for times between t0 = 2100 and tT = 3600.
which is a monotonically increasing function just like that in Fig. 2 between t0 = 0 and tT = 2100. So, what have we learned? Those three innocuous looking numbers in the LA triplet have a surprising amount of depth behind them. The triplet is intended to provide you with some kind of information about how much work has been done on the system in the recent past (1 minute), the past (5 minutes) and the distant past (15 minutes). The “load” is not the utilization but the total queue length. They are point samples of three different time series. They are exponentially-damped moving averages. They are in the wrong order to represent trend information. These inherited limitations are significant if you try to use them for capacity planning purposes. I’ll have more to say about all this in the next online column Load Average Part II: Not Your Average Average. Learn how to do capacity management and get to know the right tools for the job.